Place 1 and 1/2 tablespoons of cheese on the tortilla. Add fruits, add another tortilla and heat in a pan for about 2 minutes on each side or until they've lightly browned. You can use cream cheese instead of gorgonzola or add pieces of pancetta or grilled chicken. You can also use your favorite fruits instead of strawberries: pear, peach, etc. 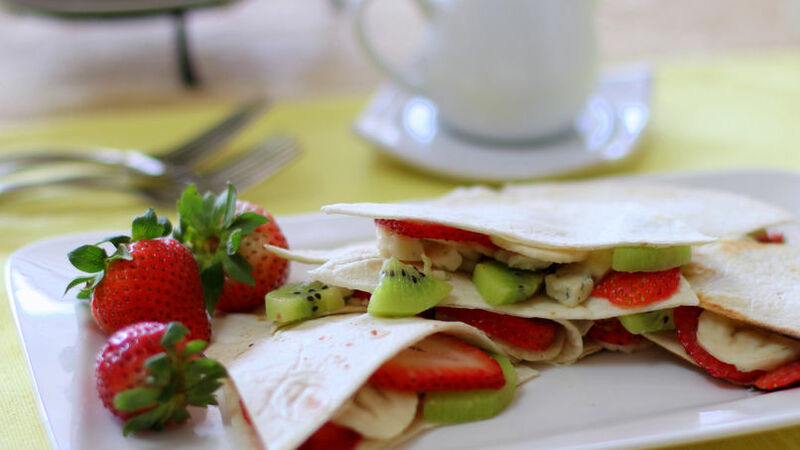 I'm sure you have thousands of ways to prepare quesadillas, but have you though of changing the flavors a bit to prepare quesadillas with gorgonzola cheese and fruits? Gorgonzola is a sweet, creamy cheese with a subtle flavor that melts very well and goes great with fruits, pastas, chicken and beef. At home we use it in sauces for pasta and my husband also prepares a kind of butter that goes very well with fresh bread or on grilled pork chops.